Anyone who has had the pleasure of traveling to countries such as Japan or China will appreciate the bewildering but totally delicious array of vegetables on offer there. A plethora of differently shaped, textured and coloured Oriental leaves brings Eastern cuisine alive. No wonder the Japanese have no problem reaching their official recommended intake of not merely five, but 17 portions of fruit and veg per day! Shungiku, also know as Chopsuey Greens is an easy and undemanding plant to grow and both the young shoots and stems can be eaten. 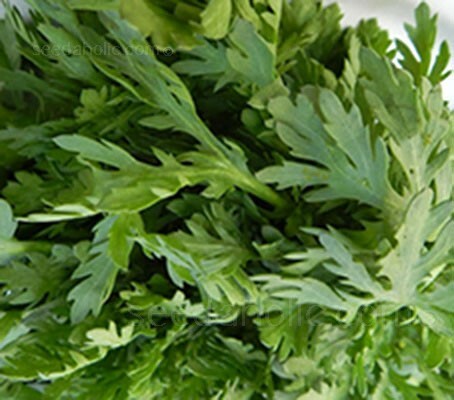 The flavoursome serrated leaves are used as both flavouring and as a vegetable. They are aromatic and taste somewhere between celery and carrots. Even the petals can be eaten and are used to make the fragrant Japanese pickle, kikumi. Grow this speedy veg in broad drills, scattering the seed along its width. The fine leaves can be used in salads or gently cooked as an alternative to spinach. The plants will grow about 15cm (6in) high and wide in their leafy stage and attain 60cm (24in) in height when flowering. They grow quickly and easily, providing tasty green leaves through the summer months and very pretty flowers into autumn, when most things are going to seed or are rapidly fading. Sow at fortnightly intervals from spring right through to early summer. Very early outdoor sowings need protection from frost. Easy to accommodate, the plants grow well in most soil types, their growth will be more vigorous and lush in soil with higher fertility. They grow well in full sun but will tolerate some degree of shade. Fill pots or trays with regular multipurpose compost; moisten by standing the container in water, then drain. Sow seeds by sprinkling quite finely onto the surface. Press gently into the compost or cover with just a sprinkling of compost. Cover the container with clear glass or plastic sheet. Once germinated, remove the glass. (If the nights are still cold, put the glass back on in the evening). Water daily, lightly at first, then thoroughly with a watering can once grown. If grown for immature leaves they can be cut within 5 to 7 weeks, space at 25cm (10in) between rows, 2.5cm (1in) within the row. If growing to maturity space the plants 50 x 50cm (20in x 20in). The plants are hardy and so can be grown in the winter under cover but are equally good sown in early spring and again in late summer, so as to avoid the warmest weather. In early spring sow seeds in a cool greenhouse or polytunnel and either transplant to beds under protected cropping conditions or plant out into the open in favourable climatic conditions. In late spring the seeds can be sown direct or into nursery beds and transplanted after about 40 days to well-prepared raised beds or ridges at a spacing of 50 x 50cm. Grow in freely draining loam soils and top dress with nitrogen during growth on soils of only moderate fertility. Irrigate during dry periods. Simply keep weed free and water regularly throughout the season. The plants manufacture compounds to inhibit pests from eating them. While slugs may rampage through your garden eating everything in sight, the Chopsuey greens will remain untouched. Harvest baby leaves as required using scissors. If grown on, the outer leaves can be harvested and plants can be left to grow on. The plants mature in 30 to 90 days. If grown to maturity the whole plant can be cropped before seed are formed. In late summer, leave some plants to flower and produce seeds for next year. Dried and stored in cool conditions the seed will remain viable for three to four years. The plant’s greens are used in many Asian cuisines. They appear in Cantonese dishes and Hong Kong cuisine in stews, casseroles, and hotpots. The leaves are also an important ingredient in Taiwanese oyster omelettes and, when young, are used along with stems to flavour soup and stir-fry. In Japan, it is used in nabemono. Korean cookery uses the greens in soups, stews, and alone as a side dish or (banchan). In a hotpot, it is added at the last moment to the pot to avoid overcooking. Chrysanthemum coronarium is a species of flowering plant in the aster family, Asteraceae. It is native to the Mediterranean and East Asia. Chrysanthemum coronarium is the basionym (a correct former name) it is now referred to as Glebionis coronaria, although most literature refers to C. coronarium. Chop Suey Greens are used extensively in Chinese, Japanese and Vietnamese cuisine. They are known as Shungiku (Chinese) Tong Ho, Kikuna (Japanese) and Ssukgat (Korean). English language common names include Garland chrysanthemum, Chrysanthemum greens, Edible chrysanthemum, Chop suey green, Crown daisy, and Japanese-green.